My head has been fuzzy for the past two days. Yesterday it was Wednesday and today, it’s been the 5th of May for two days running. Do you ever have weeks like that? A woman came to take a class with me 12 years ago. The week prior to her arrival, she’d spent four and a half days with a “couture” sewing celeb who taught her to apply interfacing by holding the iron in place for a count of ten. This I discovered when I put “M” to applying interfacing to leather and contrary to my instruction (she was eager to apply the proceeds of that $3,000 fee) she insisted on the ten second count and of course, the piece was shriveled and burnt beyond recognition. It looked like a pig’s ear that had gotten too much sun. I saved that piece for a long time, I don’t know where it went now. Lately I’ve been reading that people still do this. The horror of it all. I thought it was an isolated incident but it would seem it is not. The very idea makes me shudder all over. If you consult industry interfacing experts -the people who make fusing machines-, they’ll tell you that applying fusibles relies on three things, time, pressure and heat. I’d add a fourth and fifth element, that of having the right fusible for the right fabric in the first place and the right tools. Of the three five, time is but one facet and not really the major one. Not when a fusing machine can fuse fabrics at 26 feet a minute. Even then, time is better calculated as during and after. It can take but a second to apply interfacing but it can take a few seconds for it to cool enough to move it. I don’t think enough weight is given to selecting the right interfacing. I get the idea that many think fusible is like sugar in a recipe, any brand for any use will do. It should be just as variable as your fabric. It is more typical than not to buy interfacing specifically for a given fabric. It is also common to have two or more kinds used in the same product depending on the desired performance. Even the amount of glue and pattern of its application matters. If I have to pick from the selection at the fabric store, I tend to select based on the backing (glue dispersal) rather than the weight. For example, if you want to interface a nubby boiled wool, you want an interfacing that withstands the high pressing temperatures wool requires (in subsequent pressing operations) and that has a lot of fat glue drops on the underside. If an interfacing doesn’t stick, it doesn’t necessarily mean the fusible, nor the fabric it is applied to, is cheap. It only means the two mediums are not complimentary for optimal adhesion. Larger firms have established relationships with vendors. The manufacturer sends a fabric swatch to the supplier and the supplier tests applications of various interfacing products to make a recommendation. The sample is returned to the customer for a final decision. As small companies, you don’t have such amenities. You’ll have to hunt and peck between available options and test pressing samples. Be sure to wash test them for stability. And no, I can’t be more specific than that. If all of you would be so kind as to make an identical product of identical materials for an identical application, then I would. But no, all of you stubbornly persist in producing a gamut of products that defy neat solutions so it is your fault. If you have to hold an iron in place for ten seconds to meld the goods, there is a mismatch between the fabric and fusible OR your iron isn’t hot enough. The right temperature for the right fabric for the right fusible is the temperature rating of the fabric itself. The fabric governs the heat relationship. Worry less about arcane solutions that don’t solve but a few problems and get things that will solve most of them. Case in point, get a silicone foot for your iron. No, there are no worthwhile substitutes so if you can’t get one for your iron and you’re serious about it, you probably need another iron (see related entries for suggestions). With a silicone foot, you will only rarely (if ever) need a pressing cloth and if you do, you’re more likely to need it under the goods you’re pressing, not above it. This also presumes (of course) that you’ve cut the fusible to be smaller than the area to which it is being applied. Sure, that takes longer in the front end but less time in pressing. You also don’t have to worry about cleaning up a mess on your board. Another example is fusing interfacing to velvets (yes, I do it all the time). When fusing velvet, put a scrap of velvet under the work piece with naps facing each other. I think people also use time as a substitute for pressure. There’s two kinds of pressure. One is weight and the other is PSI -steam. You don’t necessarily need a heavy iron but don’t buy something that feels like a toy. You should never have to apply pressure (weight) with the iron. In a perfect world, you could afford an iron for which the amount and temperature of steam is independent of the iron plate temperature (a boiler iron). If not, a gravity feed may be a solution. If the fabric is low temp and rated below what will generate steam from the iron, a quick spritz with a water bottle should be all you need. That sort of pressing may take a second or two longer but only because the low iron heat needs more time to evaporate the water. If all the governing factors are balanced, fusing interfacing should not take any longer or be any different than normal pressing. If your fusing is taking too long, time is the symptom of a more complex problem rather than its solution. It had to be said. Thanks for the posting, my mind is much clearer concerning interfacings. Life is too short to worry about how many angels can dance on the head of a pin. That’s why I use non-fusible interfacing. We teach our students to “make a sample” then they can determine the proper interfacing woven, non woven or sew in to be used for the fabric. We rely on gravity fed irons / but no vacuum table which differs from the equipment in industry. Another common mistake that our students make is not allowing the steam to dry out of the fabric before picking it up. A vacuum table with a boiler iron is not a household thing. 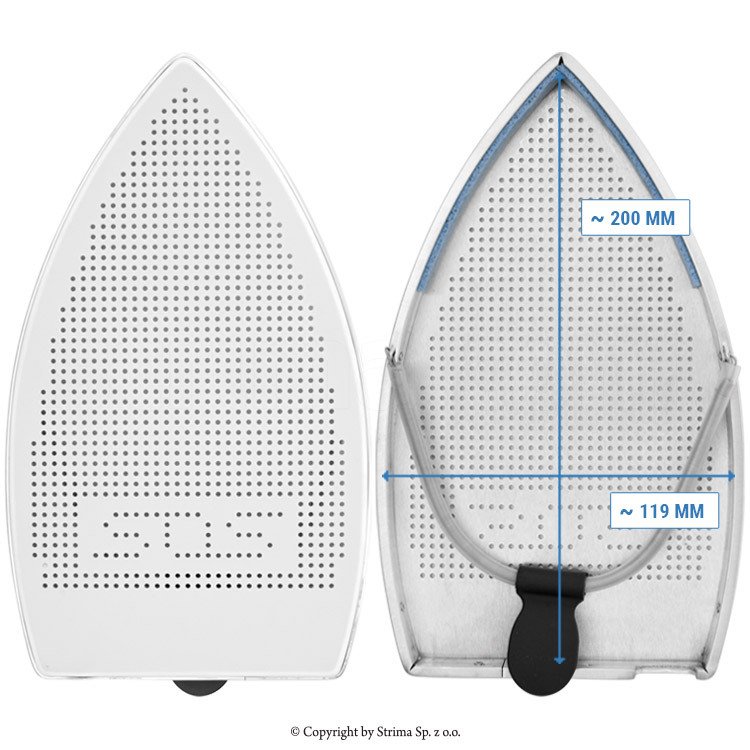 First, the vacuum table has suction form the vacuum to it, no regular household folding ironing board has that. Those table come in different sizes here as well. As for the boiler iron…it’s a stainless steel tank that is separate form the actual iron, it gets hot enough to boil soup on the outside of it, really cool. Die Haushaltsversion is made less solid and is safe to touch from the outside, generally found at trade shows and cost more then my gravity fed one, but cost more. A gravity fed iron is an iron that has a water tank hanging on the wall and gravity feeds the water down to the iron via a hose, they are about $200, a heck of a lot cheaper then the boiler iron. As for aluminum for sole plates, sounds ok, at least it won’t rust. So, I’ve never actually seen someone apply interfacing (like, in person) and so I’ve never been able to ask this: Is interfacing correctly stuck if you can pick it off with your fingernails and some patience? Okay, I’ll admit I’ve been left confused. Here I thought I was doing the right thing by purchasing a variety of interfacings from a vendor we know and love and by following her directions to a T, which incidentally include holding the iron in place for 20 seconds on the wrong side and another 20 seconds on the right side. I’ve been really pleased with these interfacings, by the way, whether using my gravity feed iron or my press. Like nowaks, I’m wondering why it’s wrong to follow the manufacturer’s instructions, unless those instructions are just some extreme set of do’s and don’ts to cover every possible variation among users. Instead, assuming we have the right product, tools and temperature for the job, should we experiment with a little time and a little pressure? If the interfacing doesn’t fuse properly, try more time and/or more pressure. Lather, rinse and repeat? Be sure to wash test them for stability. By stability, do you mean that the interfacing remains fused or is there more to stability than that? @ Sabine: So maybe I just don’t know the right English word for my pressing equipment? I can describe that I have a foldable table that heats and that definitely has a suction. Maybe not a vacuum suction, I have no idea, maybe there are other techniques to do that? Attached to the table is a… well I’d call it a boiler? It’s a container, stainless steel inside and has a insulation outside to prevent burning something else. Inside that container the water gets heated. Attached to the water tank is the iron (with a hot water hose), it has a stainless steel sole and only few steam holes at the tip. The heating of the iron is independent from the boiler. And the professional ones are a good deal more expensive. So, please tell me, what would that be called in English? Thank you for clearing that up…I knew they had the domestic versions of the boiler because my friend had one-did not know they had the domestic versions of the vacuum/suction table. Never hurts me to learn something new though. The only industrial one I worked with had a tank that held about 8 liters of water. My gravity fed one, which does not hang right over my head, that would be scary, but rather to the right of the table on a hook on the wall, holds about 3l of water and is made of plastic and there it is safe. Domestic boiler irons were scary expensive like ten years ago. Then Aldi (a food discounter who presents every week a certain amount of non food products and usually for a very good or at least cheap price) started selling some for a low price and I think that popularized them widely. (Though I think most people do not have the vacuum table.) On the other hand when I lifed in France a little more than ten years ago the small domestic boiler things were sold at supermarkets, so I guess they were popular there before. Lisa’s list of instructions sound very much like what I send with every order. My interfacings are of a very high quality…but…I cannot be standing over every customer’s shoulder, test the heat of their iron, or make sure the iron is heavy enough, or know how they are going to wash the garment, etc. So because I want the customer to have The. Very. Best. results with my products, I try to “cover all the bases.” Let me add that because of the type of fusible resin that is applied to the substrate fabric of the interfacing, there is NO strike-through when fused as directed. Months of testing went into my product development, including sending large sample to many experienced and beginner “home sewists” (aka, enthusiasts). Their results and my professional experience were taken into consideration when writing the fusing instructions for my products. So far, So good….1000’s of orders and countless letters of praise bear it out. I bought recently a Reliable v-700 iron with a separate boiler built in so I can steam a piece of silk using silk heat. Also have a Reliable steam press. Have been using Teflon sheets on top without any steam but still using the 10-seconds. Perhaps use another sheet on bottom and then I don’t have to measure the interfacing so carefully? Only a home sewer. With respect to Nowaks ironing set up. It is more common to have this sort of arrangement in Europe. I believe Els has a similar configuration. This is in part cultural (like bidets, which I love) but also infrastructure. The voltage is different there. The average domestic consumer in the US cannot use what the average domestic consumer uses in Europe because of power. My system runs on 110v but it is the only thing I can have on that circuit. In regards to interfacing manufacturer’s instructions, they have to develop guidance based on the lowest common denominator because they cannot factor the varying conditions between consumers. This is also true of retail sewing patterns, they have to provide the simplest instruction because consumers span a wide range of skills and tools. I can only tell you that a manufacturer would never buy an interfacing that required so lengthy a time for adhesion. But then again, among manufacturers, there is an expectation of competency and presumed application standards, at least with respect to tools and materials at one’s disposal. In home sewing, the interfacing manufacturer would be considered to be at fault if the interfacing did not adhere. In industry, it would be the opposite (reasons explained in the entry). This gap of expectations is what retail interfacing manufacturers hope to correct with instructions for overly lengthy pressing times. Because let’s face it, no consumer is going to buy that interfacing because the manufacturer is considered to be at fault… and people wonder why industrial suppliers don’t want to deal with retail sales or sales to enterprises so small that there is not much difference between them. Dennis: get a foot for your iron and use the teflon under the work piece. Lisa: I forgot to mention in my comment that I use Pam’s interfacing. No discourtesy intended to Pam but if there were instructions, my auto-pilot throws them in the recycling bin. Frankly, I don’t recall. The only sure thing is that I did not read them. I apply Pam’s interfacing exactly the same way I use any other kind -namely, a short pressing time- and they always perform the same way I expect other professional products to (great). Iow if you have good equipment and are using the right combination of materials to interfacing, you probably do not need that long setting cycle described in the instructions. Thanks for all the replies. I feel like a free woman! LOL. Next time I apply interfacing, I’ll experiment with less setting time. I can’t find a single fusible interfacing that will stick fast to the back of 100% wool fabrics with my domestic-but-with-separate-steam-generator iron. As in, I fuse them, leave them to cool/dry, and I can peel the interfacing off, which as far as I’m concerned means it will eventually bubble. I’m stuck with sew-ins, it seems. Kate….. I would be happy to recommend the proper types of professional quality interfacing for wool. I cannot mention them here, because it would be advertising, sorry. However, feel free to contact me (click on my name) and I will not only recommend the proper interfacings for wool, but I will also send you a few sample swatches. Yes, I know I might get more than a few requests, and will send samples to those who want them, if I get a self-addressed *double stamped* envelope in which to send them ;). Just contact me for the rest of the information. This is a commercial site Pam, as long as certain guidelines are followed, there is no problem. What I won’t publish are drive-by posters who drop a business card, Iow, the topic is how does one do X and somebody just says they can do that and leaves their contact info never to be heard from again. They don’t contribute to the conversation, they don’t provide assistance or suggestions, and ideas etc. You don’t post here every day but you’re a frequent enough visitor that if you just want to leave the sourcing info because it’s topical (and it is), then that’s okay too. I prefer hyperlinks so people can contact you unless someone doesn’t have a website. I am interested in your comment on a “silicone foot for your iron”. I searched the internet but only found a Chinese manufacturer who had a minimum order of 1000 pieces! Could you direct me to a picture of what you are talking about? Is it the ‘thingy’ (technical term!) that ‘straps’ onto the bottom of the iron? The only silicone foot I have seen here (Australia) is an iron rest but I do not have one as my iron shuts itself off if it is left face down for too long. Where does moisture enter the equation? Kathleen mentions time, pressure, and heat as the most important factors in industrial applications, but not moisture. Or, do some/all/none of the fusibles used in industry not require moisture to activate the glue? My experience is not in any way at odds with Kathleen’s advice, since my experience would probably be classified under Wrong Everything: product, pressure, tools, temperature, and time. Still, I’m curious about how moisture fits into the equation when using the proper products and tools. yes, it is that strap-on thingy that goes on the bottom of the iron, called a silicone or teflon shoe. there are two kinds, one is just a silicone sheet, the other one is a silicone bottom put over an aluminum frame. Thanks, Sabine – I will go find one. I think moisture would do more to prevent bonding, than assist. The resin melts with heat, merges with the fabric fibres, then sets as it cools to form a bond. I think moisture just gets in the way and prevents adhesion. Maybe your iron is hotter when you steam, so maybe try a slightly hotter temperature instead? My domestic iron is really ‘cold’ – meaning I use it on the cotton/linen setting for everything! Sherry and all..when I recommend to my retail customers that they use steam, or give the professional interfacing that I sell a very light spray of water just before fusing….it is because I want the fabric fibers to “swell” slightly during the fusing process, so that if they use less-than-professional pressing techniques, the interfacing’s resin will have the best chance to “grab” the fibers and sink into them. I then recommend they follow with a brief press with a dry iron to finish the bonding process. Also, the reason I recommend a press cloth is because I do not know what “gunk” may be on the bottom of a retail customer’s iron..I’d rather have them scorch the press cloth than their interfaced pattern piece. But Kathleen and the others are right, a Teflon “shoe” is the best way around using a press cloth. My experience with moisture is: some need, some don’t Since we get only Vliseline interfacing in Germany which comes with detailled instructions for each kind I’ve used quite a lot of that stuff and their instructions were always right, if they said “damp press” cloth then it would not stick well without, if they said “no moisture” then it would only stick when applied dry. And if they say “doesn’t matter”… then it didn’t. All: it is really really helpful to read material I’ve linked to, especially if you don’t agree, don’t understand etc. Commenting without reading seems to be increasingly common all over the web (not just here). Sherry, that moisture prevents bonding might be true in home sewing being that home sewing often seems to exceed the natural laws of physics; but it is not true in industry. The point of discussion in this entry specifically and also generally, is it is mostly not a matter of opinion and again, the previous entries do provide support material so those would be good to read particularly if dissenting etc. I think in this application, the main purpose of the steam is to serve as a heat transfer medium, much like using oil when frying in pans. It is under pressure in the boiler, but unless it’s enough to actually lift the iron when it comes out, it’s probably not significant compared to the weight of the iron. It doesn’t hurt that it increases the humidity while it heats the fibers, but heated water retains its heat better than, say, a container of compressed, heated air. Anybody wanna look at steam tables (pdf)? I suppose you could use heated oil, but you would reeeaally hate those results! Thanks for the correction. My own logic was that resin and moisture wouldn’t work well together, but Eric H has summed it up well for me – that steam serves as a more potent heat transfer medium. Thanks – I learnt something! You should NEVER use steam to apply fusible interfacing. Dry heat and pressure are all that is needed. Steam will cause the interfacing to bubble up and not adhere properly. Steam is only used with haircanvas and buckrum in tailoring applications. Penny, you’re speaking to industry professionals here. If they say they use steam then they use steam.